Having devoted his life to writing, Ralph Fletcher has strived to improve the quality of the teaching of writing for young people. A prolific author and inspiring presenter, he’s written books both for teachers and aspiring young writers on the art of writing. His other works encompass poetry, picture books, chapter books, and young adult novels. I grabbed a coffee break with him and found him generous, funny, and his drive to pass on to children the love of writing was strongly evident. As a novice teacher in the mid-nineties, two of his books, A Writer's Notebook and latterly, Craft Lessons were influential in creating and evolving Writers Workshop in my second-grade classroom. If you want to follow up and discover more about Ralph's approach to teaching writing and supporting young writers, then you should get one or both of his new books Joy Write, which encourages teachers to allow time for student choice during the process of writing, and The Writer’s Teacher’s Companion, in which the spirit of the book is you to get there, from here. Ralph makes it doable, not intimidating. It’s a great support for teacher’s who feel overwhelmed by the teaching of writing. What resources, for example, books, researchers, journals, etc., do you find most supportive in your growth as a literacy instructor, and why are they important to you? I read Language Arts, it’s one of the journals that I think is really important in our field. Teachers often feel quite isolated, so when you ask about resources, I think professional organizations are really important, and I am a member of NCTE (National Conference of Teachers of English). I’m very involved and I always go to their conferences, and I usually present at those conferences. Organizations like that and ILA are important for teachers to make bonds with other educators to not feel so isolated. I wish when I started teaching there was Twitter. Do you think Twitter has helped in forming bonds? Yes, I do think it has changed the way we form bonds, such as the PLN (Personal Learning Network). I know a lot of people are finding ways to connect virtually or with blogs, but I also think there’s nothing like physically meeting with people. I'm diminishing the importance of connecting via social networks, but I think that alone is insufficient. You need to be in a room where you are hearing a speaker and applauding, and at a certain point, you feel a connection. I started teaching in 1995, and my colleagues and I used your books to start our writer's workshop. The books were incredibly helpful. You've done so much in the field and offered a lot of advice, but what is one piece of advice you would share with other educators? What is your nugget? 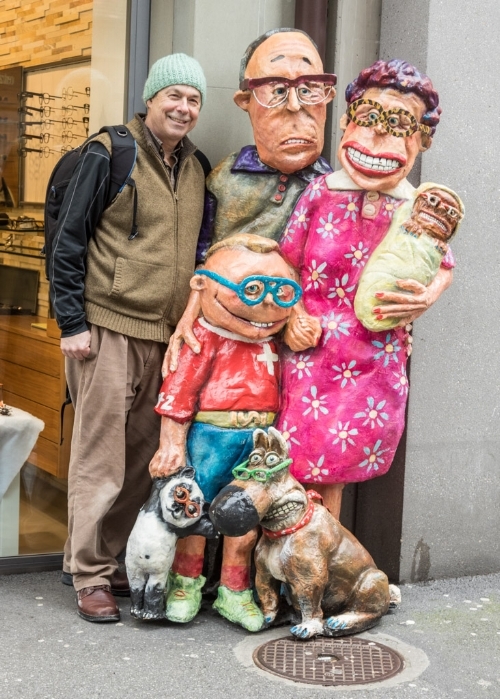 Ralph with "friends" in Geneva, Switzerland. I’m not the first person to say this, but I think it’s important to be a practitioner, and not just to be a teacher. If you’re talking to kids about reading, you also need to be a reader yourself. If you’re talking to kids about writing, it's good that you actually are writing alongside them - they see you writing. You know, roll up your pants and wade into the same waters that they are wading into. I think that's really important for a lot of reasons; it keeps you honest, kids will respect you for taking the same steps they're taking, and if you’re asking kids to do something that doesn’t make sense to yourself, then maybe you’ll take a second look at it and possibly revise your teaching. So I think it’s important to be a practitioner. I’ve heard a lot of teachers say their own writing is hard. Writing is hard, so you have to have something that you want to write about and interests you, which is the same for kids. I think kids will work hard when they see the value in it, and I think that’s true for adults, too. I like to say we can all be a writer with a small w. Even if you’re not getting published, you’re writing and sharing with your kids, and you can be a learner alongside them. You don’t have to be an expert, like Joyce Carol Oates, to teach them everything. What do you believe is especially important for educators to understand about being a teacher of writing? There’s so much to say, and it’s hard to pick something out. We live in a world of soundbites and bumper stickers, but having said that, one thing I’ve been thinking a lot about lately is that when teaching writing, we want to instill a sense of identity in our students. So they see themselves; I’m a soccer player, I’m a reader, I’m a writer... so they take on that identity, and so they write more frequently. For example, you cook one fancy meal a year, you don’t feel like you’re a cook. If you’re cooking on a regular basis and you cook for your Saturday night dinner parties, pretty soon you’re cooking frequently and getting responses to your dinners, and you start to feel like a cook. I’m especially thinking about elementary school teachers, in that we want kids to leave the school with a sense that I am a writer. To add to that, I really emphasize this in my new book, Joy Write. I think as teachers, part of our goal is to engender a love of writing and reading, which is a basic ideal. But if we're covering all the standards, and they hate writing, then we've lost the whole thing and we’ve missed the point. We want kids to leave elementary school saying I love to read and I love to write. When you see little kids with their markers and papers, they like to write and they like to draw. You go to a group of kindergarten or first-grade kids and they are writing and drawing. Writing a few words here and there and name up top. I think kids want to write, but I hate to say it I think we beat it out of them. We take something that should be fun and a way to express themselves, and we turn it into something academic and not fun. So your new book Joy Write is about bringing joy and independent writing back with student choice and voice? Yes, I use the metaphor Greenbelt. I read all Carl Hiaasen's books and the battle between environmentalists and the developers in Florida. I don’t mean to pick on Florida, but that's where you are. I generally side with the environmentalists, even though people need places to stay. One of the points I’m making is, even in developed places there are Land Planners who create green spaces that are untouched and wild and important. Important to species, important to habitat, important for recreational use. I love to take pictures of birds, I’m a passionate bird photographer, so if I was visiting you I would take my camera out there and find all kinds of cool things to photograph. Well, I’m encouraging teachers to create a writing greenbelt in the classroom. So even if you have certain types of writing that you have to do by your curriculum, kids should feel like there are these green spaces in the classroom, where they can really write with passion and total choice. You ask me about Joy Write. One of the important elements of this book, and I’ve been writing about this for years, is to bring back more choice in writing. I think that choice has really been shaved for a lot of young people. I say this in the book and in most cases, “kids have a lot more choice in reading than in writing.” We want kids to go to the library and pick out a book they are really interested in, or authors they love. We know that when they do, there is a better chance of reading that book. Well, we want kids to be choosing topics that are interesting to them, that they're passionate about, that they know something about. We know if they have choice in their topics, they have a better chance of finishing what they’re writing about, and actually writing something good! I’m on a mission to bring back more choice. I like that, I’ll help you! How or what do you do to ensure all students are learning when they're writing? I am a constructivist. I think kids learn by doing. If you do whatever it is you're talking about; cooking, playing tennis, me... taking pictures. If you do it enough you learn how to do it, and if you hang around other people who are passionate about it, you learn also. I think in America we’re a little top heavy on the assessment. Here we are, May 1st, we’ve had a really cold spring in New Hampshire. Looking out the window the grass is finally coming green. Some flowers are coming out - crocuses and daffodils. If you pull those little seedlings out of the ground and look at the roots and stick it back down again, they're not going to do that well. I know that it's kind of a glib analogy, but I do think some assessments are intrusive in America. I’d like to see us return to a time where we had more faith in kids learning by doing. The next level up is that the reason this doesn't happen is that we live in a time where we don’t trust our teachers either, therefore the administrators who are just obsessed with test scores push that down on to teachers, the teachers push down on to the students, and the students hate writing. That’s unfortunate. So I’m not really answering your question exactly, but I would like to see more engagement, and less heavy accountability and testing. If you hosted a dinner party, for literacy greats (authors or educators, dead or alive), who would you invite and why? It can be a big or small dinner party. Who’d be on your guest list? That’s a good question. I’d probably pick on of my favorite authors I really love, and not an educator. One of my favorite books is, One Flew over the Cuckoo’s Nest, by Ken Kesey. He knew a lot of the beat authors like Ginsberg, and all those guys. I would love to have dinner with him and talk. Also, Richard Ford, I’ve read all of his books and I really like them a lot. He’s got an intelligent male narrator in most of those books which you don’t see in a lot of fiction. I'd love to talk with him about things I notice in his books. These guys had a big influence on me as a writer. Follow him on Twitter @FletcherRalph. FYI… Heinemann has the best price, as of today, for Joy Write, and they are having a Teacher Appreciation Week special. Receive 30% off and free shipping within the U.S. Joy Write, which encourages teachers to allow for student choice during writing time, and The Writer’s Teacher’s Companion, the spirit of the book is you to get there, from here. Ralph makes it doable and not intimidating. It’s great for teachers who feel overwhelmed by teaching writing.